Paralyzed by ganglia necrosis, cannabis helped this New Zealand teenager regain the use of her arms. After one spray of marijuana-based Sativex, Grace Yeats was already feeling better. Paralyzed by ganglia necrosis, cannabis helped this New Zealand teenager regain the use of her arms. Grace Yeats was thirteen when she was first diagnosed with severe ganglia necrosis. Ganglia necrosis is a disorder caused by the death of tissue in regions of the brain that control motor skills. This can either lead to unwanted muscle spasms or paralysis, making it similar to Parkinson’s Disease or Multiple Sclerosis. Grace has been battling this all-consuming disease for two years. “Just to look at her makes yourself feel uncomfortable,” Grace’s mother Tracy Yeats tells John Campbell of Checkpoint. When it came to treatment, Ms. Yeats and her daughter had exhausted all of their options with little relief. And then Ms. Yeats tried Sativex. Through continued use of the medication, Grace was able to regain movement in her hands and her arms. The ability to use her arms is crucial to Grace because it allows her to use her iPad. Her iPad is the primary way that she is able to talk and communicate with people. While on other medications, she had lost the ability to use the tools that enable her to interact with the world. Grace was also able to finish her favorite meal four days in a row since taking the oral spray. While Sativex is a highly effective drug, it sets the Yeats family back $1100 per month at their local pharmacy. Marijuana is illegal in the UK, where the drug is produced. GW Pharma is now known for being a leader in cannabis-based pharmaceuticals, and is a publically traded corporation. 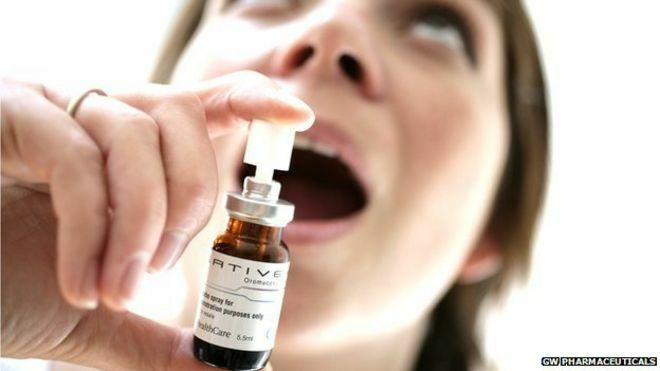 Sativex contains a 1:1 ratio of THC to CBD. You can currently find marijuana strains and tinctures that contain the same ratios at US dispensaries for around $10-12USD per gram. Obtaining the Sativex was also no easy task for these Kiwis. Marijuana is not legal for recreational or medical purposes in New Zealand. Associate Health Minster Peter Dunne has even called the fight for medical access “emotional nonsense”. In order to get ahold of the medicine that so greatly improved her daughter’s quality of life, Ms. Yeats and a team of specialists had to apply for ministerial approval. While stories like Grace’s might be a bit “emotional”, at this point there’s no doubt that cannabis has been able to help those with debilitating illnesses find relief. In Grace’s case, extracts from the marijuana plant allowed her muscles to unfurl and relax. In other cases, cannabis has helped fight melanoma and other cancers. Watch Grace’s story in the video below. Weed may not be legal in New Zealand for quite a while. In the meantime, if you’d like to help Grace Yeats access the medication she needs, you can donate directly to her cause via One Dollar Warriors. Has cannabis helped your muscle spasms? Have you had any experience with Sativex? Write to us with a piece of your story on social media or in the comments section below. Want to stand up for cannabis access in New Zealand? Share this article and help spread the word! Marijuana legalization cannot happen without your support.